Princess Eugenie of York's wedding is quickly approaching, and I've seen some discussion online about the tiara she may choose to wear for the big day. (Bets seem to be on her mother's bridal diadem, the York Tiara.) 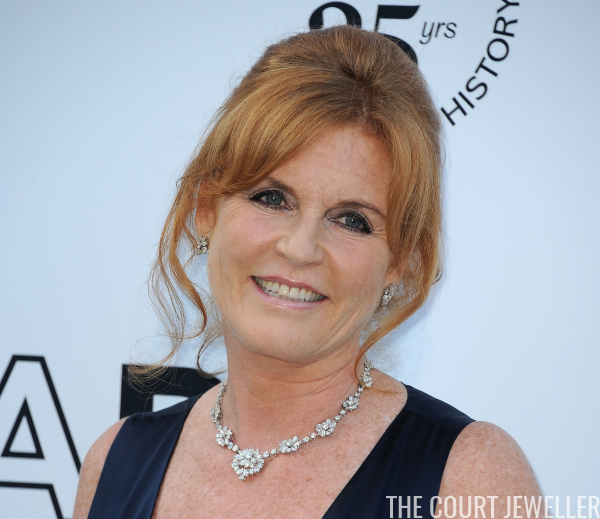 But Sarah Ferguson also received another dazzling wedding present from the Queen: a floral diamond demi-parure that we may be able to spot on either Sarah or Eugenie this Friday. 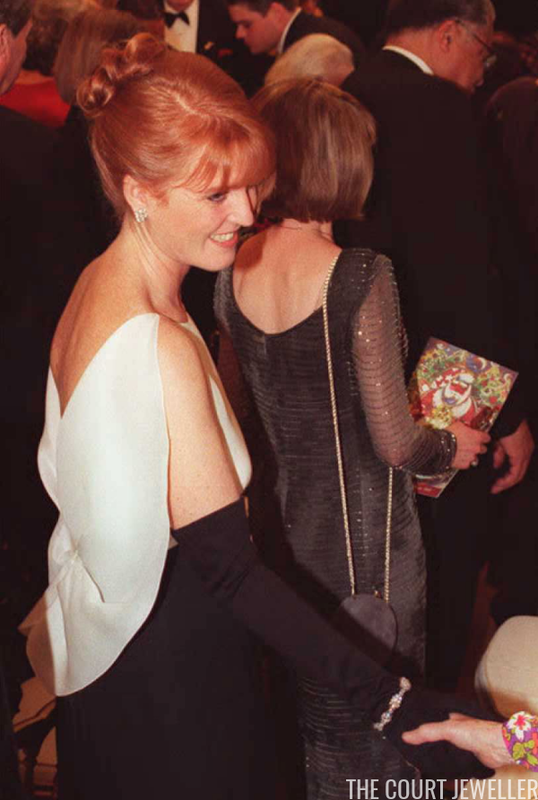 In 1986, when Sarah Ferguson married the Queen's second son, Prince Andrew, she and Prince Philip purchased a tiara for their new daughter-in-law from Garrard. (You can read much more about the tiara here!) But that wasn't their only gift. They also bought Sarah a suite of diamond jewels in a modern floral design from Garrard. The set consists of a necklace, a bracelet, and a pair of earrings. The set was valued at around $500,000. During her brief tenure as a royal duchess, Sarah wore the set frequently, often pairing it with the wedding tiara. Although the tiara and the demi-parure were bought around the same time from the same jeweler, they are not a matched set. 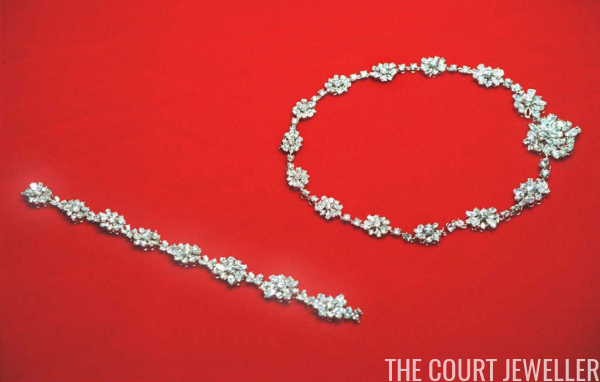 The Yorks attended gala events during various royal tours, including visits to Canada and France, and the diamond demi-parure was often seen on these occasions. On at least one occasion, Sarah's hairdresser placed the bracelet in the back of her updo. Sarah and Andrew separated in 1992 and divorced in May 1996, but she kept her jewels. She's maintained a high profile since then, appearing at numerous premieres, charity galas, and other events, often in connection with various products and projects she's endorsing. Only a few months before the divorce was finalized, Sarah traveled to the United States to attend a reception at the White House. She brought the diamond demi-parure with her. When going through security at JFK afterward, the unlocked bag containing the diamonds was mistakenly (according to Sarah) placed with baggage to be checked rather than with her carry-on luggage. You can probably guess what happened -- a teenage baggage handler opened the bag, discovered the jewels, and pocketed the necklace and the bracelet. 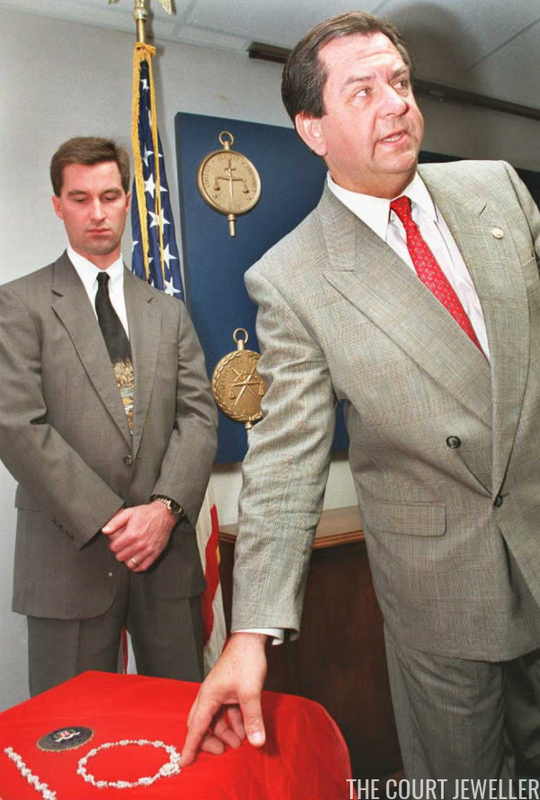 He took the necklace home to his family. Five stones were pried out of the necklace, which was then stashed in a tool shed behind the house. The bracelet was left in his locker at the airport. Sarah didn't discover that the jewels were missing until she arrived home in Britain. The FBI ended up recovering the pieces and arresting the baggage handler, but the assistant director of the New York office of the bureau questioned why Sarah had left the valuables in such a vulnerable position in the first place, noting, "I don't think it shows a lot of wisdom myself. I certainly wouldn't do it. But I personally wouldn't have a half a million dollars of jewelry." Interestingly, Sarah claimed that it was her lady-in-waiting, Jane Andrews, who had ultimately decided to check the bag. In a twist, Andrews later served time in prison -- but for murdering her lover, not for mistakenly checking a bag containing royal jewels. For years, Sarah kept the demi-parure in the back of her jewelry box, but on occasion, she's brought the set out again. She donned the complete diamond suite at the amfAR Cinema against AIDS Gala in 2011. Here's a look at the bracelet from the 2011 appearance in Cannes. 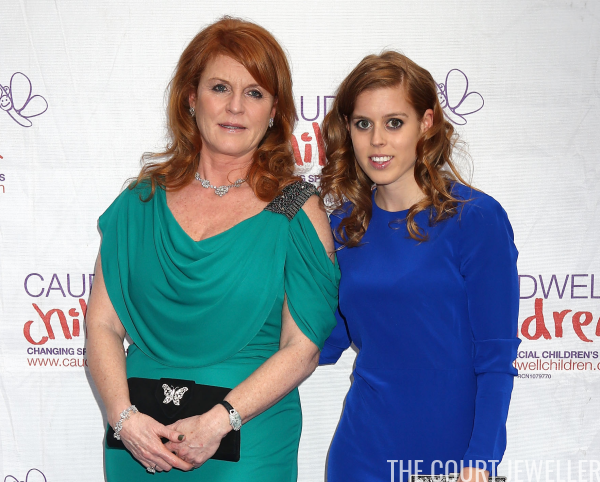 A year later, she also wore the set to the Diamond Butterfly Ball in London, an event she attended with her elder daughter, Princess Beatrice, at her side.